A fresh Status Yellow snow and ice alert was issued by Met Éireann amid further snow and sleet showers overnight due to the polar air mass stalled over Ireland. The alert, which will remain in place until 11am today, covers Wicklow, Donegal, Leitrim, Mayo and Sligo. Motorists were warned that snow and ice may pose potentially hazardous driving conditions on higher ground in those five counties as well as inland and northern areas. Snow showers yesterday hit parts of Mayo, Donegal and Cavan which just last week were enjoying balmy spring temperatures. 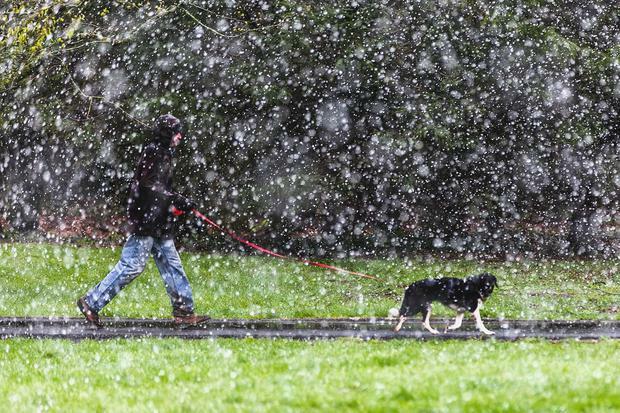 Ireland's wild weather mix saw various parts of the country experience snow, frost, ice, hail stones, sleet, torrential rain showers and even brief spells of sunshine all in the space of just 12 hours. A heavy frost is again likely in most parts of Ireland today with temperatures set to fall to -1C overnight with a risk of sleet and even snow showers. It will remain very cold for the next two days with maximum temperatures never rising above 10C - some seven degrees cooler than just last week. Blustery winds, influenced by a northern air mass over Ireland, will make it feel even colder. "It will remain very unsettled and cold due to the Polar air mass over the country. Temperatures will remain well below average for April," forecaster Matthew Martin said. Next weekend will see a slight recovery in temperatures of up to 11C though it will remain unsettled. However, the week before Easter is set to offer the best weather of the month with temperatures likely climbing to 13C and many areas enjoying good spells of sunshine. 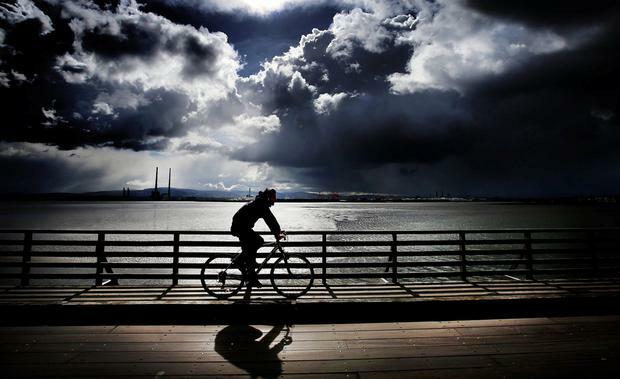 Met Éireann's spring weather summary confirmed that March proved a wet month with temperatures slightly above average. Two storms were recorded, Storm Freya and Storm Gareth, which both helped contribute to the above average rainfall levels. Every Met Éireann recording station showed rainfall above long-term average values, ranging from 109pc (Mace Head, Galway) to 225pc (Shannon Airport, Clare). Two stations at Casement Aerodrome in Dublin and Newport in Mayo recorded their highest rainfall totals since March 2008. The heaviest daily rainfall of the month was recorded at Sherkin Island in Cork on March 5 with 33.8mm. Finner Camp in Donegal recorded a total of 26 days of rain in March. Temperatures were above average at virtually all weather stations in March while the south east recorded above average levels of sunshine. Malin Head in Donegal recorded the highest wind gust of the month at 130kmh. Mícheál Ó Scannáil The country is set to bask in warm spring sunshine this week with temperatures to reach as high as 16C.